Warm evenings and endless summer days give you every reason you need to pull out the grill. Next time, try these grilled lamb chops. Before they hit the flames, be sure to rub down your chops with rosemary paste and let them rest. A salted paste acts like a brine, causing meat to “sweat” and meat proteins to breakdown. For you, this means a tastier lamb chop and concentrated flavor. 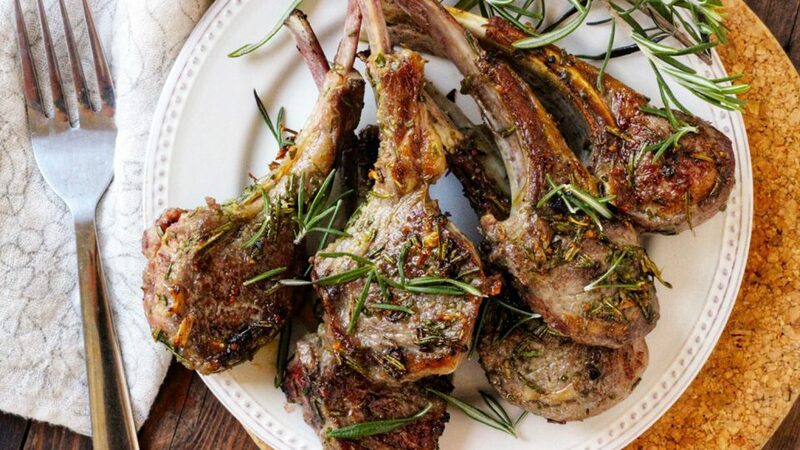 Lamb will always and forever pair beautifully with mint, and these chops are no exception. Try serving your grilled lamb chops alongside Sauteed Zucchini with Mint, Basil, and Pine Nuts . Peel and coarsely chop the garlic. In a food processor fitted with the s-blade add the oil, spices, rosemary and garlic and pulse until well combined. Rub the paste on both sides of the lamb chops and let them marinate for at least 1 hour in the refrigerator. Remove from refrigerator and allow the chops to come to room temperature - about 20 minutes. On the grill set to high or on the stove top, heat a heavy bottomed pan over medium high heat. Add the lamb chops and sear for about 2 minutes. Flip the chops over and cook for another 3 minutes for medium-rare and 3 1/2 minutes for medium.